Ryan Connon, the most senior staff member at Wilfrid Laurier University’s new Yellowknife research office, was born for the job. Literally. He was born in the community of Edzo, now named Behchokǫ̀, about 80 kilometres northwest of Yellowknife. However, his parents returned to southern Ontario when he was two – too young to remember the North himself. Connon was raised with pictures and stories from his parents’ days in the North and was always determined to go up there himself. He first got a chance during a third-year undergraduate co-op term while studying physical geography and hydrology at the University of Waterloo. He loved it as much as he thought he would. 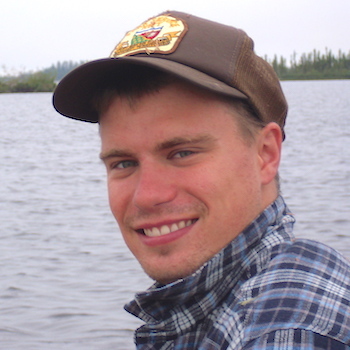 In his fourth year, his professor suggested he approach William Quinton, a Laurier associate professor with expertise in cold regions hydrology, about graduate school opportunities. It turned out to be a good recommendation for both sides. This summer, Connon successfully defended his PhD in Geography under Quinton’s supervision. Recently, he was selected to receive the Medal for Academic Excellence at the doctoral level at Laurier’s fall convocation. During his studies, he received a prestigious graduate scholarship from the Natural Sciences and Engineering Research Council of Canada, among numerous other awards. Now Connon is senior research associate in hydrometeorology, part of Laurier’s growing team of northern-focused researchers. Though most are based in Ontario, visiting the North regularly for fieldwork, Connon and a few others will be based in Yellowknife full time. This will allow them to do more fieldwork year round as well as build deeper relationships with partners and facilitate the work of colleagues based in the South. Connon is still working closely with Quinton and others as part of the Northern Water Futures (NWF) project of the Global Water Futures program, for which Laurier is partnering with three other universities. NWF, which aims to respond to water security challenges posed by climate change in the North, is led by Laurier’s Jennifer Baltzer, Canada Research Chair in Forests and Global Change. Laurier’s Yellowknife research office had its grand opening on Sept. 25 and Connon was on hand to greet the dignitaries, who included Yellowknife Mayor Mark Heyck, Deputy Minister Joe Dragon of the Northwest Territories Ministry of Environment and Natural Resources, Chief Edward Sangris of the Yellowknives Dene First Nations, and Laurier President and Vice-Chancellor Deborah MacLatchy. Connon was proud to show off the office and thrilled to have moved to Yellowknife. The town, he says, has a friendly, tight-knit feel and is beautiful, being right on Great Slave Lake. It has all the amenities important to him – gyms, well-stocked supermarkets, places to hang out and have a beer or watch a football game with friends. Life in a field camp doesn’t have those perks. However, Connon, who for the last few years has spent an average of three to four months a year in the field, mostly at the Scotty Creek Research Station, loves it just as much – if not more. That’s not to say it’s easy to live in a research camp with just four or five others. Connon’s research primarily focuses on how permafrost thaw is changing the landscape – specifically, how water is cycled and stored. For example, a forest that once grew on top of a continuous layer of permafrost may develop holes, or taliks, in the permafrost. This destabilizes the land and trees, which may fall or tilt, producing a “drunken forest” effect. The talik areas may form connections with other holes and provide additional pathways for runoff to reach river networks. “Now you’re opening up different runoff pathways that were previously unavailable,” says Connon. “You’re enabling a more rapid response to snow melt and precipitation and changing the storage-to-runoff ratio." This is already happening, says Connon. Over the last few decades, stream flow has increased significantly in the Scotty Creek area, and he and his colleagues have been able to show it is primarily due to changes in surface and subsurface water flow. Highway washouts are becoming more common and infrastructure is under strain. The land is getting wetter, which makes it more difficult for people who hunt, fish and engage in other traditional activities to get around. It’s hard to predict just how much flooding there will be and where, never mind what other effects climate change will have on water availability in the North. Large river systems, such as the Mackenzie, are more complex than the smaller streams Connon studies. However, he knows his work is important as part of a larger scientific collaboration.